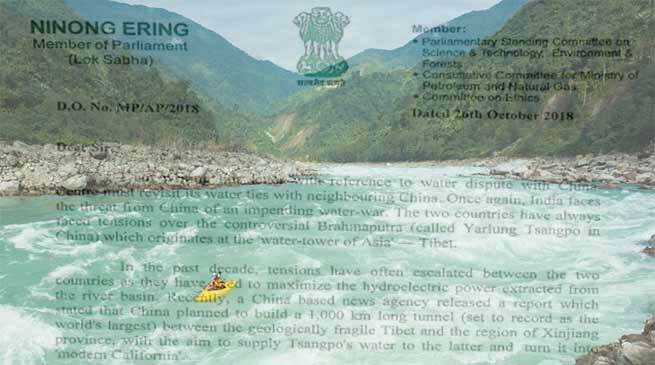 Ninong Ering writes a letter to Arjun Ram Meghwal, MoS, Water Resources, on the issue to revisit water ties with China. once again, India faces the threat from China of an impending water-war. The two countries have always faced tensions over the controversial Brahmaputra (called YarlungTsangpo in China) which originates at the ‘water-tower of Asia’ — Tibet. In the past decade, tensions have often escalated between the two countries as they have tried to maximize the hydroelectric power extracted from the river basin. Recently, a China based news agency released a report which stated that China planned to build a 1,000 km long tunnel (set to record as the world’s largest) between the geologically fragile Tibet and the region of Xinjiang province, with the aim to supply Tsangpo’s water to the latter and turn it into ‘modern California’. Chinese officials were quick to refute the existence of such a project, especially since it proclaims devastation for the North-Eastern region of India (esp Assam and Arunachal Pradesh) and Bangladesh which are heavily dependent on the river economically as well as ecologically. However, if history is any indicator, the country has carried out its hydro-logical projects unabashedly, leading to great devastation in countries like Vietnam which was agriculturally dependent on the Mekong River. In such a scenario, there is a greater need for a diplomatic intervention, which can ensure that India doesn’t find itself holding the shorter end of the stick at the end of this ambitious project. North-East India has faced great repercussions over the disturbed ties between the two countries — in the form of Assam floods (when India didn’t receive Brahmaputra’s hydrological data from its upper riparian neighbour) or the border tensions in Arunachal Pradesh when China tried to rename places in the region. But the time has come when North-East India gets a greater say in the matter over the water relations of the two countries. The government of India cannot ignore the threat that China poses and should strive to make the North-East region less dependent on the water from the Brahmaputra, which is currently yielded as a weapon by our northern neighbour. In this, a few proposed suggestions to resolve the matter would be that the two countries sign a treaty which limits them from tarnishing the ecological identity of the river Brahmaputra/YarlungTsangpo. This treaty would entail a cap on the number of projects the two governments could carry out on the river. China is also not a signatory to the UN Convention on the Law of the Non-Navigational Uses of International Watercourses, for it limits the hydropower capabilities of the country as the convention calls for “equitable sharing” of water. Diplomatic pressure must be mounted on China and Bangladesh can emerge as a great ally in this for its interests align with India on this matter. In the same vein, the North-East region of India is one of the biggest buyers for Chinese goods. The Ministry of Commerce and Industry can impose a trade embargo which can limit the economic trade between the two countries (in the region) in case of a water dispute.